Seventh August 1918 was an uncertain time in history with the Great War still raging, although the allied forces were clearly in the ascendancy. Perhaps it was the knowledge that some sort of normality was returning to civilisation that inspired a group of eleven young Sydney boys to form a sporting club. The boys named their club the Briars and one hundred years on they continue to embody everything that is positive about amateur sport. 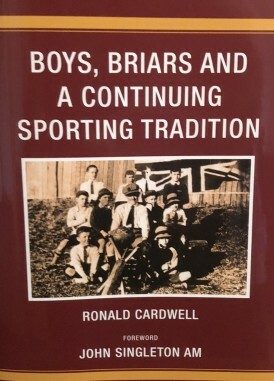 Author Ronald Cardwell, writes that the original Briars met in a chook shed located at one of their parent’s houses, in an inner Sydney suburb, and from information gleaned from an extant old minute book, appeared to spend as much time smoking as they did playing sport. Originally their sporting endeavours were scratch matches, with cricket always to the fore. However as their numbers started to swell they branched out into other sports, such as Rugby and athletics. The Briars always included a social element to help fund their sporting focus. From an early stage they organised dances and concerts, as well as selling tobacco. The author takes us through these humble beginnings to what the Briars represent today; one of the biggest and most successful amateur sporting organisations in Australia, with numerous teams in a number of sports including cricket, rugby, hockey, squash, bowls and netball. Histories of sporting clubs can tend to drag. Fortunately Cardwell keeps the story moving and has a great eye for humorous anecdotes. The author also does not shy away from controversy and is happy to criticise some decisions and mistakes made by the Briars over the years. One of those mistakes was the sacking of John Singleton, for suggesting ways to raise funds for the Briars. Looking back it seems incongruous to sack a marketing guru when they offer free advice on how to make money for their club. Thankfully now is all forgiven and Singleton is once more a Briar. During its time the Briars board appear to have been sticklers for the rules, with one member being disciplined for turning the queen’s picture towards the wall. Cardwell also lists more serious offences such as stealing from the till. The one thing that is clear from this book is the spirit and good sportsmanship demanded from all Briars’ participants. They appear to always play fair although they clearly also play to win, which is the Aussie way. As Cardwell takes us through each era of the Briars the same problems keep cropping up, such as lack of members and financial troubles. Somehow the Briars have always found a way however and now after 100 years appear to be in a strong financial position. The Briars have also adapted and moved with the times, although they did resist female members until 2001. Cricket has been a mainstay of the Briars and they have been very successful in the game. The level at which the Briars compete means they have not produced any Test representatives, but still have a proud cricket history which dates back to 1920. The book itself is beautifully produced and well written, and will be the benchmark for all those compiling a history of their sporting club.